Primary discovered 1930 Jan 23 from Lowell Observatory, Flagstaff, Arizona, USA by C. W. Tombaugh. Linked to prediscovery observations from 1914 Jan 23. Named 1930 Mar 24 for the mythological Roman god of the underworld [MPCI4157]. Permanent number assigned 2006 Sep 07. The search resulting in its discovery was motivated by Percival Lowell, seeking to identify a hypothetical "Planet X" producing gravitational perturbations on Neptune's motion. Early estimates of Pluto's diameter were in the range 4,000 km to 12,000 km; only with the discovery of Charon was Pluto's size recognized as about 2,400 km. With the discovery of trans-Neptunian objects beginning in 1992, Pluto was then recognized as one of the larger members of the class of TNOs. It was classified as a planet from its discovery until 24 August 2006, when the IAU created a category "dwarf planet" to include Pluto; on 7 September 2006 the MPC assigned minor planet number 134340 to Pluto. 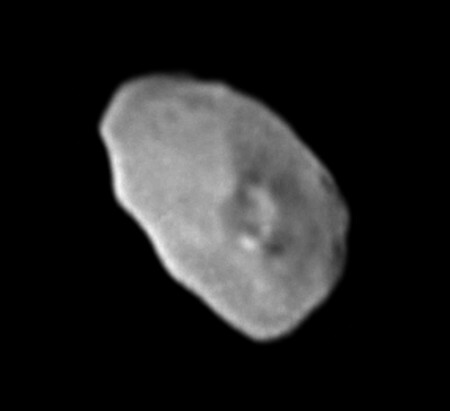 Charon discovered 1978 Jun 22 by J. W. Christy using IMG observations over the period 29 April 1965 to 12 May 1978 from U.S. Naval Observatory, USA. Announced 1978 Jul 07 [S78b]. Provisional designation S/1978 P1. 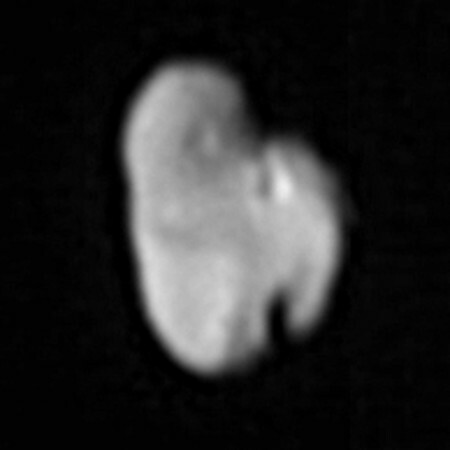 Permanent designation I Charon, assigned 1986 Jan 03; named for the Greek mythological character [M86a]. 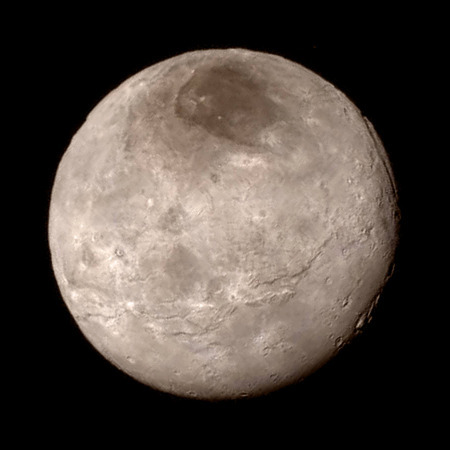 Among satellites of planets or dwarf planets, Charon is larger with respect to its primary than any other. 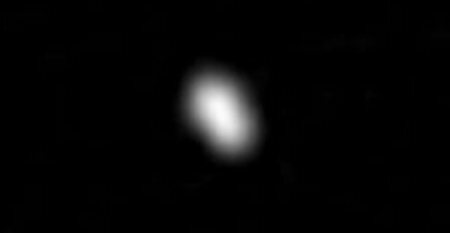 Nix discovered 2005 May 15 by H. A. Weaver, S. A. Stern, M. J. Mutchler, A. J. Steffl, M. W. Buie, W. J. Merline, J. R. Spencer, E. F. Young, and L. A. Young using observations from Hubble Space Telescope. Announced 2005 Oct 31 [G05c]. Provisional designation S/2005 P2. Permanent designation II Nix, assigned 2006 Jun 21; named for the mythological Greek goddess of night [G06c]. Hydra discovered 2005 May 15 by H. A. Weaver, S. A. Stern, M. J. Mutchler, A. J. Steffl, M. W. Buie, W. J. Merline, J. R. Spencer, E. F. Young, and L. A. Young using observations from Hubble Space Telescope. Announced 2005 Oct 31 [G05c]. Provisional designation S/2005 P1. Permanent designation III Hydra, assigned 2006 Jun 21; named for the Greek mythological monster [G06c]. Kerberos discovered 2011 Jun 28 by M. R. Showalter, D. P. Hamilton, S. A. Stern, H. A. Weaver, A. J. Steffl, and L. A. Young using observations from Hubble Space Telescope. Announced 2011 Jul 20 [S11b]. Identified in pre-discovery observations from 2006 [B15c]. Provisional designation S/2011 (134340) 1. Permanent designation IV Kerberos, assigned 2013 Jul 02; named for the Greek mythological monster [G13a]. Styx discovered 2012 Jun 26 by M. R. Showalter, H. A. Weaver, S. A. Stern, A. J. Steffl, M. W. Buie, W. J. Merline, M. J. Mutchler, R. Soummer, and H. B. Throop using observations from Hubble Space Telescope. Announced 2012 Jul 11 [S12g]. Provisional designation S/2012 (134340) 1. Permanent designation V Styx, assigned 2013 Jul 02; named for the mythological Greek goddess [G13a]. Mutual eclipses and occultations by Pluto and Charon occurred from 1985 to 1990, permitting determination of various physical data. 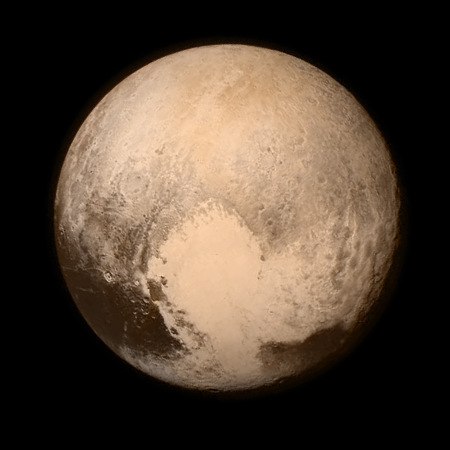 Pluto was confirmed to have a thin atmosphere in 1988, including nitrogen, methane, and carbon monoxide. 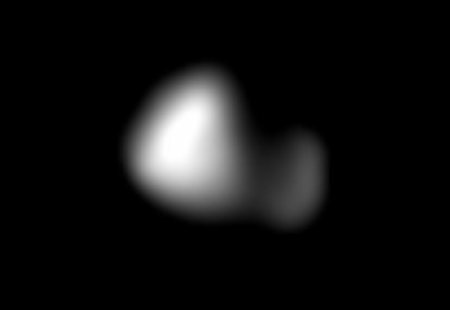 The New Horizons probe made its flyby of Pluto on 14 July 2015 at 11:50 UTC, passing 12,500 km from Pluto and 29,000 km from Charon. Several images initially returned are shown below; download of the entire flyby dataset to Earth (including all imagery) will take until November 2016. ...would make a very long list. See PLUBIB.TEX: A bibliography of Pluto by R. W. Marcialis for a list of references.